Information provided by William F. & Ileen Smith Published in the newsletter in 1996. Santee Drive was dirt and dust for the early part, and you could see the salesmen in their vehicles "stirring up the dust" to the lot of choice! The lake was developed in sections, which is why the numbers today may seem a bit confusing. When a lot was sold, the loud speaker would blare out, "Lot 160 – sold! Lot 233 – sold!" The restaurant was one of the first structures constructed by Charles Lee for Maurice and Jean Humpert. The only water supply was an old well south of the restaurant that had been the Creech family water supply and not a great well at that. The Humpert's began serving sandwiches, etc., with American Realty paying for some of the treats. 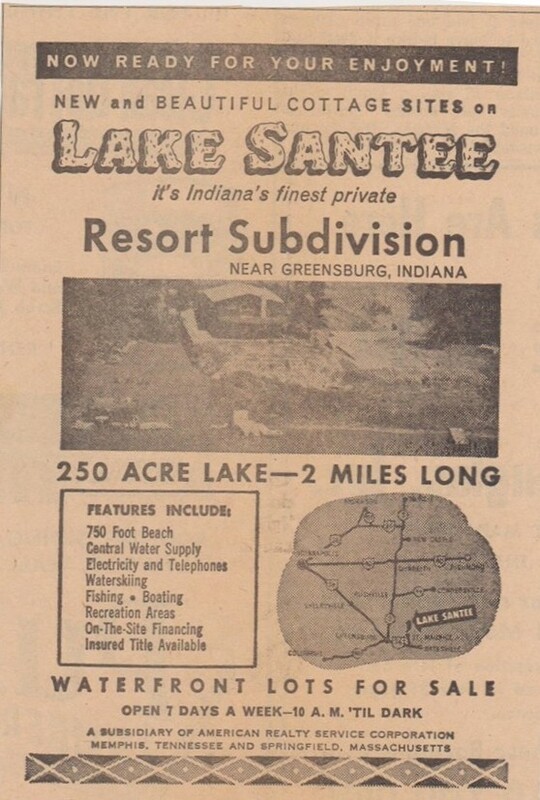 Prior to developing Lake Santee, the realty company got permission from the county commissioners to blacktop the county road from Lecher's corner to include County Road 400 North to the entrance, with the agreement that the county would maintain the road in the future. In fact, County Road 400 North in early spring was hardly passable due to such poor drainage and overall condition, almost like a county road of the early '20's and '30's. In the fall of 1964 they began to haul some stone on the Santee Drive and some roads to the lake area, as a group of roadmen from Kentucky were constructing the roads and access areas. In the summer of 1964, they did chip and seal Santee Drive. There was early pessimism from local residents of Franklin, Decatur, and Rush counties as to whether or not such a private project be successful. Layne/Northern contracted to build a central water system. The system contained 28 miles of water lines, a water tower, and a processing plant. Over 18 wells were drilled, but only three were good enough to produce an ample supply of water. Dudley Lawrence was engineer and ran the water utility until it was sold in 1966 to Philip Willke (Wendell Willke's son), Robert and Wilmer Platt, and William F. Smith. The plant was expanded later, and a 2,000,000-gallon reservoir was constructed. The utility was later purchased by William 0. Smith, Franklin D. Smith and William F. Smith. Frank Smith was certified operator and manager until sold to the property owners in 1992. Part of the lake area north of Snake Road was sold to Ray Hatton, thereby reducing the current size of the lake to just under 1200 acres. When all the lake lots except for a very few were sold in 1966, American Realty offered the property owners the right to take over the lake. Some of the American Realty lakes were still operated by the realty company. By membership vote of consideration to accept the lake property from American Realty Company, a board of directors was appointed. The first president was Lynn Thurston; Morris (Tony) Miller was secretary/treasurer and manager. Ray Geis, Robert Platt, Ronald Beard, Maurice Humpert, Willard Gulley, Ford Kennelly and William F. Smith assumed board positions with staggered terms of 1, 2 and 3 years. The Board, before taking over from American Realty, demanded they blacktop Santee Drive (not chip and seal), plus they requested equipment: a grader, dump truck, tractor/mower and other items. Tony Miller and later Evelyn Ricker served as part-time managers. They received very little pay, and much of the early work was done by volunteers. One of the best ideas was keeping John Miller who was an employee of the realty company for maintenance. He did a yeoman’s job to keep workers for mowing, grading, etc., and he always seemed to know the whereabouts of potential problems plus the things to do. For many years he was the only one who would mow the south side of the dam with the tractor mower. Herb Shafer and Son constructed the hexagon building for security and office use; much of this was volunteer contributions and labor. The secondary beach restrooms were constructed in the late 1960's. Ray Geis constructed the marina and leased the operation to John Meek. The marina has been expanded considerably and is now owned and operated by Greg and Cara Geis. The restaurant area was doubled in size together with deck (deck made possible by contributions). Maurice and Jean Humpert made it their home as well. The restrooms were paid for by the property owners. Many of the early improvements were made by contributions and volunteers, just as now Lake organizations such as the Women's Club, Kiwanis, and Booster Club make donations of funds and labor for the benefit of the Lake. The first property owner to construct a dwelling was Emerson Gilchrist on Lot 357, now owned by the Franklins. He had to carry water to cook, bathe, etc., until the water utility was able to supply water. For $4.00 per month the customer could use, but not abuse, all the water they would need. There are only two original structures from the farms still located at Santee. They are the Sizemore dwelling at Lot 515, now owned by the Adams, and the Dwenger dwelling, Lot 77, now occupied by the Lampings. There was a good gambrel roof barn on the Sizemore property that the realty company first decided to leave as a recreational building, but due to the location at the north end of the lake, it was later sold and moved. The maintenance building was built about 1969, and later expanded to include the addition for the fire department trucks. Early aerial photos show where the roads stopped and how they were constructed in sections, how the lake bed was stripped to only stumps where trees had been, and a few of the early dwellings, most of which were summer homes. It is interesting to see the aerial photos now, as we (the Wm. Smith's) had photos taken of our 40 acres this past summer. Many shots show the Lake, as it is now, the second largest community on weekends in Decatur County, other than Greensburg. The original 1686 lots were owned by 1200 property owners; this now has decreased to about 800 property owners. Of the approximately 480 houses constructed to date, only around 60 are in the original hands. Original owners were mainly from Ohio and Indiana, but others were from Kentucky, Tennessee, North Carolina, Florida, Michigan. Florida, New York, New Mexico, Wyoming, Illinois, Missouri, Texas, and Kansas. To name some of the property owners who have resided for at least 20 years at Santee: Hutton (Stitts); Roberts, Creason, Werner, Stenger, Jones, Marcum, Linderman, Young, Baker, Bowers, Beard, Bischoff, Adams, W. Smith, Weed, W. Barber, Melle, McQueen, F. Meyer, Riley, Fay, McGhee, Kennelly, Schultz, Plummer, Denton, Wissell, Taft, Early, Irwin, Vail, Hite, Cooper, D. Smith, Shelby, Stewart and Ricke. These are the "old timers" remembered by Mr. W. F. Smith, though he notes he may have missed a few.